Hillary Clinton supporters are claiming she should be President because she won the "popular vote". Donald Trump created a firestorm in response when he tweeted that he would have won the popular vote if illegal votes were deducted. All of this raises some interesting questions. Did illegals vote? If so how many? Could it be enough to change the popular vote results? But before we get to that, should we even look at the popular vote? How many Trump voters stayed home in states like California, New York, and Illinois because they knew their votes were meaningless in states that hadn't chosen a Republican since cars had cranks?You can't hold an election based on one set of rules and then scream foul when your losing candidate would have won based on some other hypothetical set of rules. Think how this would work in sports. The baseball World Series winner is determined by a best-of-seven series of games, and this year the Chicago Cubs won four games and therefore won the series. But in the popular vote of runs scored, it was a tie! Sometimes the losing team outscores the winner over the whole series, but they still lose, and no one claims otherwise. Same in football, where the only thing that matters is outscoring the opposing team at the end of an hour. But sometimes the team that loses has more offensive yards, dominates the clock, completes more passes, forces more turnovers, etc. But they still lose. Only in politics do we play this game of retroactive rule making, and the reason we do so is based on pervasive ignorance about Federalism and the founding of the country. But there are other more nefarious reasons. Say, that looks an awful lot like that blue election map at the top of the page! 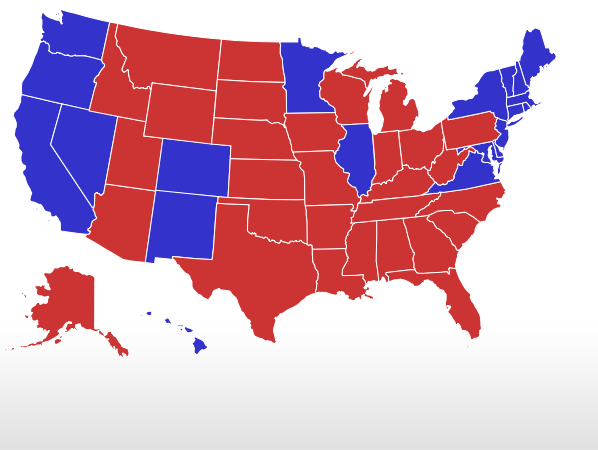 Interestingly, Utah is the only state that went red of the states that allow illegals to get drivers licenses. But Utah requests a picture I.D. to vote, and illegals are issued a distinctively different license. In short, the correlation in the two maps is undeniably and statistically significant. 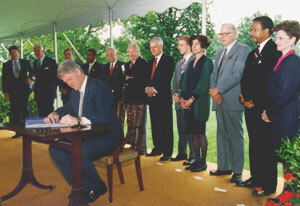 Here's a picture of Bill Clinton signing the Motor Voter bill. Notice the two people standing directly behind him? They are Francis Fox Piven and Richard Cloward in the green and grey respectively, two radical Columbia University professors who advocated collapsing the U.S. by overloading it with dependents. So how many illegals and non-citizens voted in those Motor Voter states? How many voted in all the other states? There is no way to ever know because by Democrat design, when it comes to citizenship, voting in most states is done strictly on the honor system. But the map speaks volumes.